This tent is a must on your next outdoor adventure. 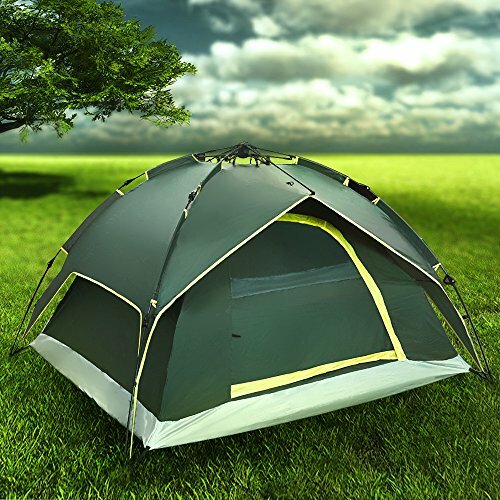 Ideal for outdoor families and extended camping trips, this dome tent offers a full feature set for a fun family camping experience. Classic dome design and automatic opening system contribute to an extremely fast set up. No assembly is required since the steel & fiberglass poles are pre-attached to the tent, and it sets up in less than 60 seconds! Waterproof & UV resistant 190T polyester rainfly can be separately used as a shelter or a beach tent and offer an excellent weather protection against rain and UV rays. Comes in a small and ultra-light package, suitable for easy carrying and storage; Ideal for camping and outdoor activities.